Oh my. These are the days I live for, even if these are the days my seasonal allergies remind me they are residents within my cranium. Today's tasks revolved around getting ready for the week ahead. Much, much to do and much of it will be out of the office. It's going to be a week of not enough hours in a day to get done everything that needs to be done. The front door decoration was changed. The recycling bin, left by the street since Thursday, was rolled to be next to the deck. Warm sunshine. Gentle breeze. I need to do dishes. The kitchen is a wreck. I'm less likely to prepare good food if there is no counter space on which to prepare it, but when do you have glorious days like this? They will soon be short in number. I need to craft. The long list, created in March, has many names crossed off, but many more remain. And it's a glorious Sunday afternoon. Perhaps I can marry the two? 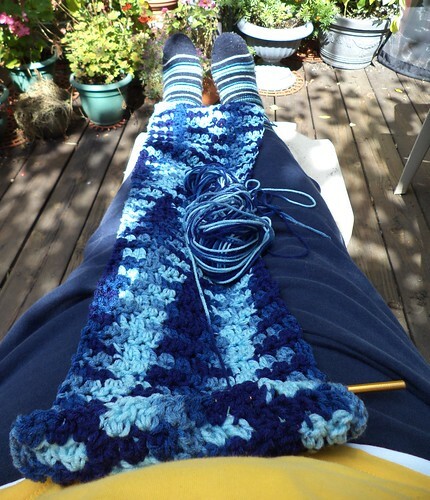 I dragged the current project, which is nearly done, to the deck, propped up my feet and crocheted. My supervisor came out and sat next to me. She's hardly a help. About every 10-15 minutes, she demanded ear and chin scratching and general, "I require attention NOW." I did a sink load of dishes and came back outside to crochet and ear scratch. We only had one altercation when I left to do a load and she left the deck. I came back outside and she was standing in the grass by the back steps. "Pilchard! Get back up here!" She knew. She knew. She charged back up the steps and into the house, getting hissed at by Mija who decided being outside was not something she wanted to do. 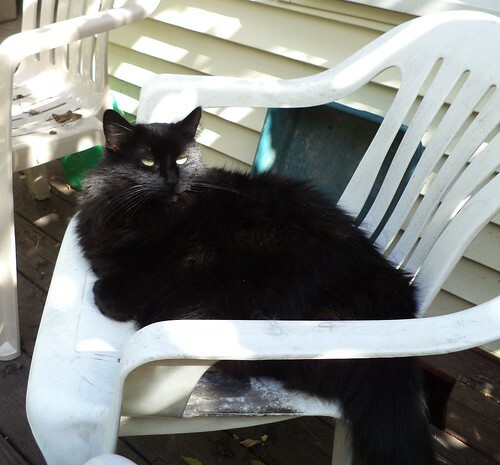 She spent a good 30 minutes in the house before coming back outside, hopping up into the chair and staying there until I was done and heading back inside. Blue is done. I'm going to be starting on some bright colors beginning tomorrow. I like this scarf. It's quite distinctive. The kitchen is clean. I'm having popcorn for supper. Lunch is ready for work tomorrow. It's been a hugely productive day. These kinds of days make me really happy.